It’s hard to believe that Kevin VanDam, the 25-time BASS winner, 4-time Classic champ, and all-time money winner, has likely fished his last BASS Elite Series tournament. Kevin, along with most other top BASS pros are moving on to the MLF Bass Pro Tour for the foreseeable future. KVD’s incredible BASS career has spanned 30 years, starting with the Arkansas Invitational on Bull Shoals in 1988 and likely ending with the 2019 Bassmaster Classic in Knoxville, TN. What better time than now to look back on the BASS career of the greatest tournament angler of all time, and see just how much money has KVD won in each state and body of water. Is This the End of KVD at BASS? These are the kind of stats that get you carved onto the Mt. Rushmore of Bass Fishing. 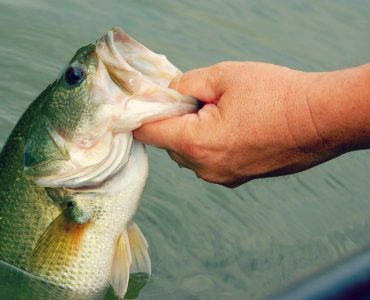 Most bass fishing fans are already aware of these amazing achievements, but it got us wondering how the numbers looked by state and body of water. We crunched the numbers and found some very interesting facts. 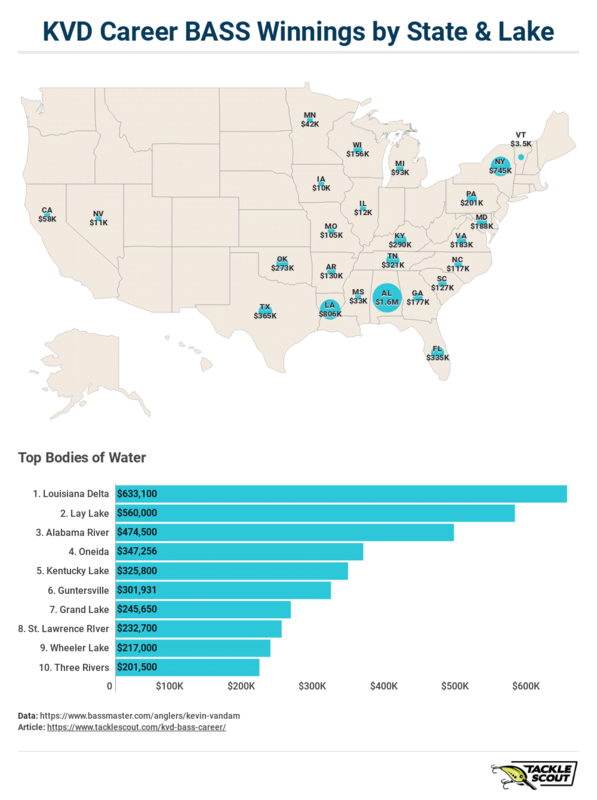 The bulk of these top three states can be attributed to Kevin’s Bassmaster Classic wins, except for New York where he was able to cash in on his world-class smallmouth catching ability. 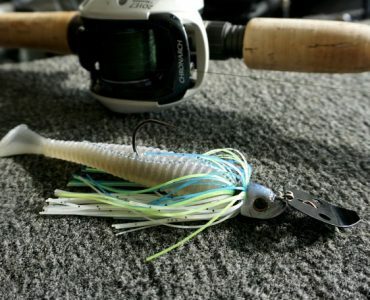 Looking at this list of lakes reminds us of two things: Power Fishing, and Smallmouth. Both of which are right in KVD’s wheelhouse. Another way to look at his dominance, it his decade by decade earnings totals. KVD may have fished on tour for 30 years, but he’s really only dominated over the second half of that span, winning over $5.3 Million in prize money over the last 15 years. This might be the most ridiculous stat of them all. The Classic and the Angler of the Year are the highest paying events the pros can fish on the Bassmaster trails, and he still tops over $4 million in winnings. He is the real-life bass fishing Terminator. 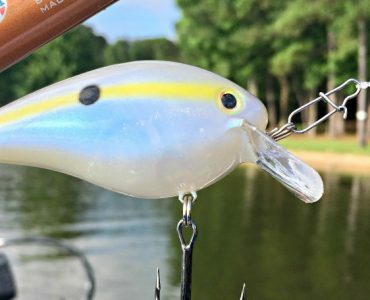 Time will tell if Major League Fishing and the Bass Pro Tour can live up to the hype and deliver on the many promises being made to the pros. For now, it truly appears like the last time you will see Kevin VanDam walk across the stage under the BASS shield will be the 2019 Bassmaster Classic at the Tennessee River in Knoxville, TN. Thanks Chad, I’ll get right on it 😉 Hope the Smallies are biting for you up there! 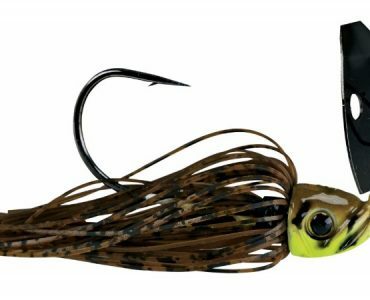 No BASS and the Elite Series will still be around next year, but KVD along with most other top pros will not. They moved from the Elite Series to the Bass Pro Tour (Major League Fishing). Great point Manny! I will add that fact to the post. I take off my hat to you. KVD you’re great. But I look up to a lot of other Pro Anglers. The younger ones and the older ones that are there. The young ones or Jordan Lee, Keith Poche, Jacob Wheeler. And the older ones Edwin Evers, Todd Faircloth, Aaron Martens, Kelley Jordon and Matt Reed. I’ve fished with some of them. You’re good, you’re fishing machine. Seen that at FLW champion on Cross Lake Shreveport, Louisiana. I ran camera boat following Brent Chapman. Wish you all the good luck in the future. Bless you. What about his MLF winnings? Brian, the focus of this article was on his BASS winnings only, since his career fishing Bassmaster events appears to be over. And, MLF doesn’t publish winnings or any kind of stats for us fans to compare anglers. Even if the Bass Pro Tour is successful, he will eventually fish a B.A.S.S. event again….perhaps an Open or other event B.A.S.S. may introduce in the future. Andy, let’s hope so, most bass fans would like to see it. Excellent article! I think you’re right, that most fans would like to see some of these guys fish some BASS events again at some point. But I also believe that some fans have become disappointed with some of the pros for leaving BASS the way they did. I’m not saying that I’m one of them. I know these guys all wrestled hard with their decision whether to stay or to go. But people can be funny when it comes to how they perceive others based on choices they make. It’ll be interesting to see how all of this plays out over the next 5-7 years, once the hype of MLF wears off.